ULI writes a positive article about Houston! (who would have predicted?) I think planner attitudes are starting to turn our way as they see how vibrant and diverse our open approach is. Goes into detail about Houston’s approach to land-use regulation. Whenever you hear criticisms of the "Houston way" of development, send them this article. Hat tip to Josh. The Texas Renaissance Festival outside of Houston has been ranked the nation's #1 cultural festival by USA Today, even beating out Mardi Gras in New Orleans! GHP released their new April Economy at a Glance report with a deep analysis of Houston's population growth over history and where we've ranked over time as well as job and airport growth updates. St. Louis is putting us to shame with how they treasure and invest in their Arch vs. our treatment of the Astrodome. Not exactly news, but this analysis re-confirms Texas has a low tax burden compared to other states. Houston ranked #4 on the 2015 Metropolitan Tech-STEM Growth Index behind Austin, Raleigh, and San Jose (Silicon Valley). "Some of the others in our top 10 are not as renowned as tech centers, but have experienced rapid growth over the past decade. The biggest surprise may be No. 4 Houston, which enjoyed a 42.3% expansion of jobs in tech industries and a big 37.8% boost in STEM jobs from 2004-14. Much of the growth was in the now sputtering energy industry, but also medical-related technology, which continues to grow rapidly. Houston is the home to the Texas Medical Center, the world’s largest concentration of medical facilities. It also ranks second to San Jose in engineers per capita." Finally, Randal O' Toole at Cato has a great idea for a better way to allocate federal transit funding - more equitable with fewer rail boondoggles. It might actually get traction in the Republican Congress. Full report here. UPDATE 5/2/15: This got turned into a Sunday op-ed feature in the Chronicle. Fun to ride with really well done stops, including nice art and signage, same as the existing lines. 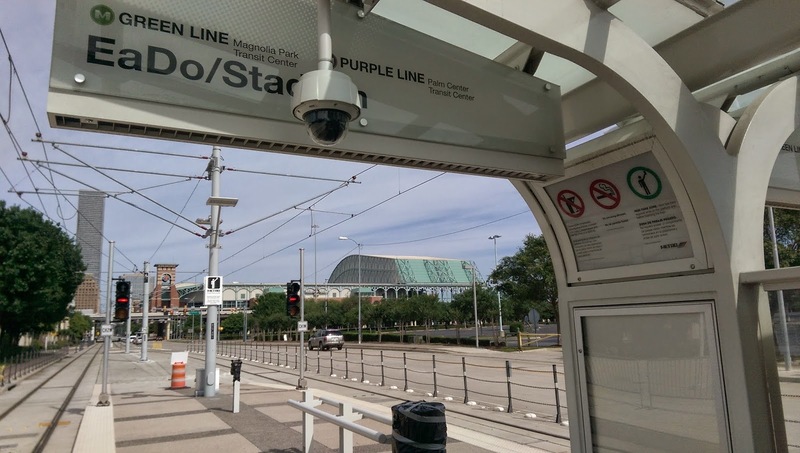 I used the Red line last week to attend the Astrodome 50th anniversary party (followed my Miller Outdoor Theater), and I have to say it was pretty awesome bypassing the traffic congestion of 25,000+ people attending that event. 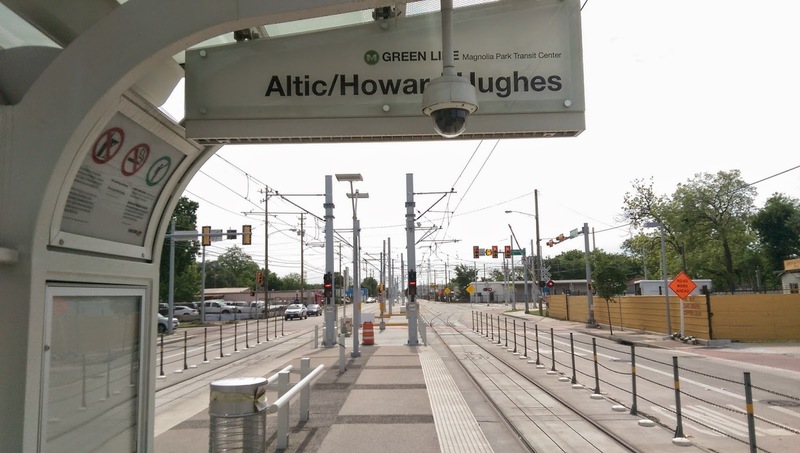 Pretty quick ride: from EaDo near the Dynamo stadium, it's 6 minutes to the current end of the East Line and 17 minutes to the Palm Center at the end of the Southeast line, although it should be noted we didn't stop at the intermediate stops. 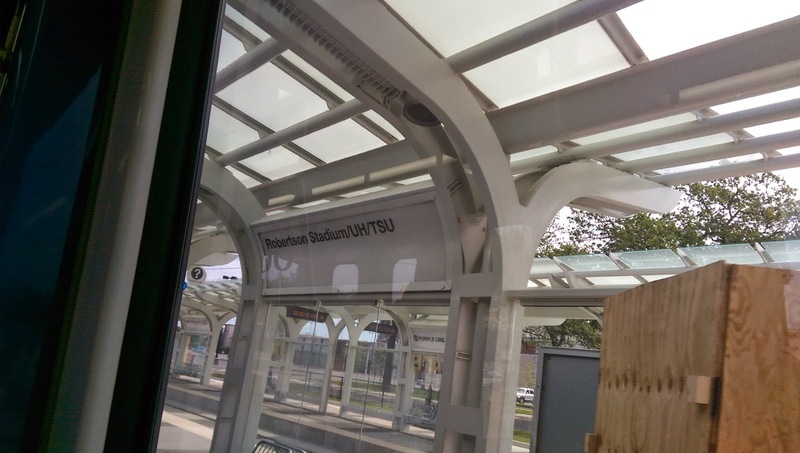 UH gets 3 stops which is really good access to most parts of the campus, including the new football stadium. I think they spaced the first two stops on the Southeast/Purple line (EaDo and Leeland/Third Ward) too far apart to effectively serve the booming townhomes out there. 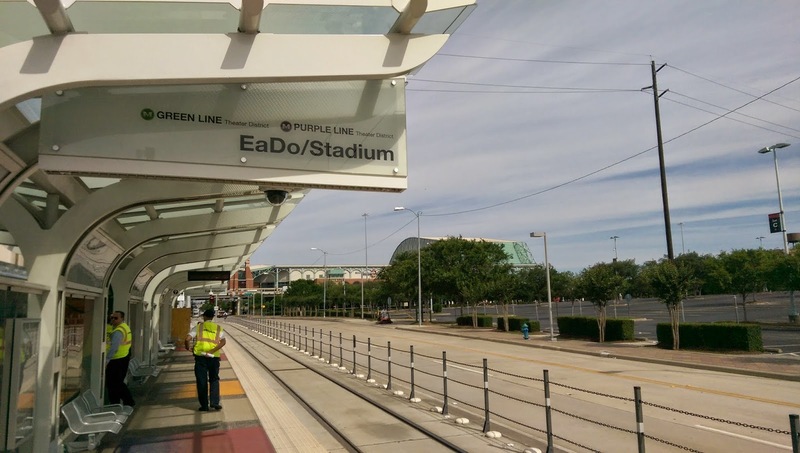 The EaDo stop is right next to Dynamo/BBVA Compass Stadium and 59, and Leeland is almost next to 45S, with no stops in between. Google Maps says they're about 1.1 miles apart. Most of the people in those townhomes are going to have a serious walk to use the lines. 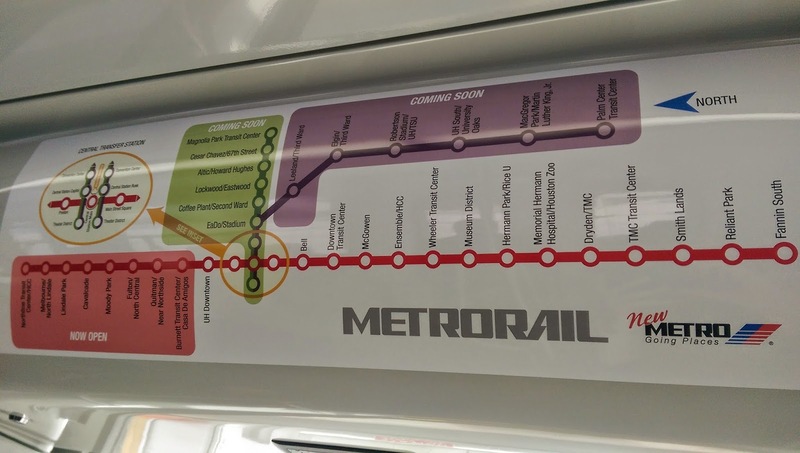 I think Metro is going to need to look at building an intermediate stop. 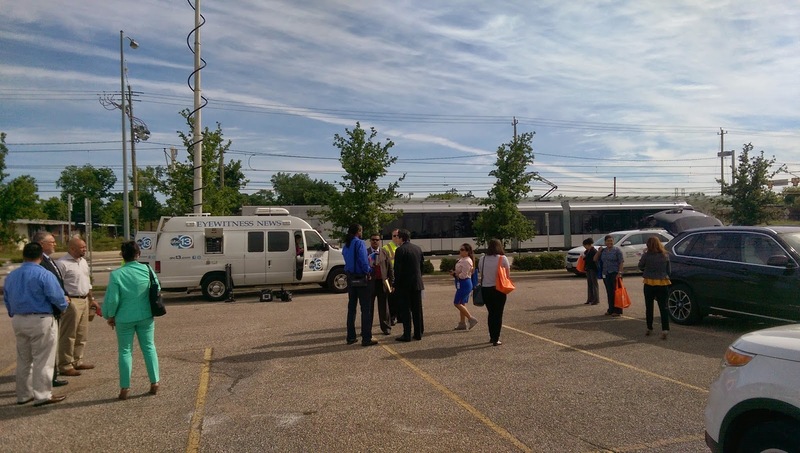 Update: Good news - Metro board member Christof Spieler has tweeted me that space for a future station has been left near Ennis and Walker. 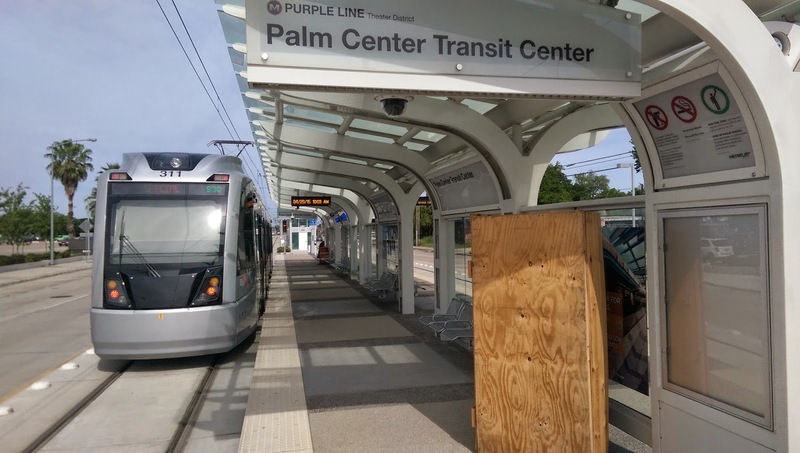 The East End/Green line won't truly be complete all the way to the Magnolia Park Transit center until the bridge over the freight rail tracks is finished in Spring 2016 (estimated). Right now it stops at Altic/Howard Hughes. I asked about the name of that stop - did you know the Howard Hughes was a big developer of the East End? I had no idea - pretty cool. Check out the bottom two photos below. See the problem? 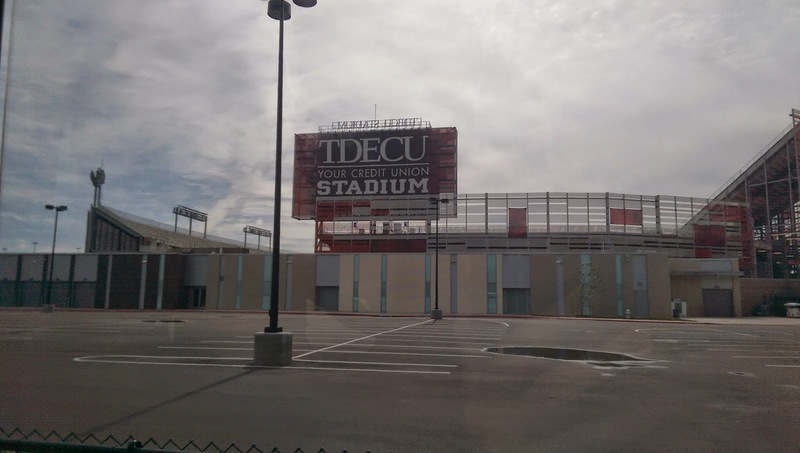 UH's new stadium is called TDECU, but the stop is called Robertson Stadium. 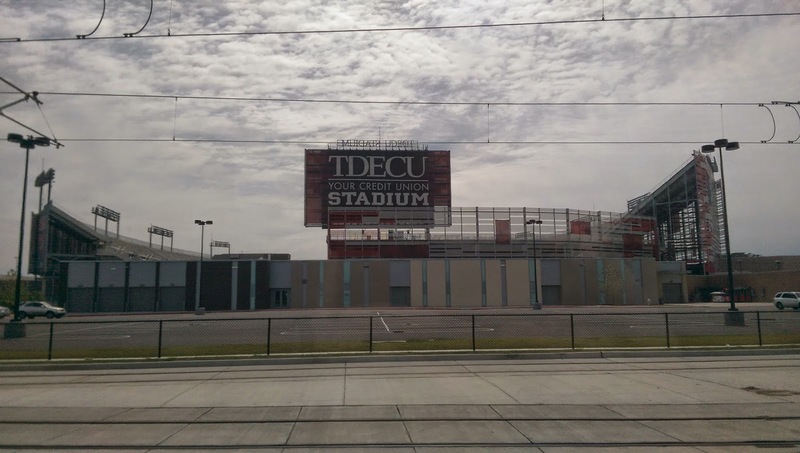 They have the same problem with the Reliant/NRG stop, and may have it in the future with Minute Maid and BBVA Compass stadiums. I was told it's a Board level decision, and they're trying to figure out a policy with all of these frequent stadium renamings. 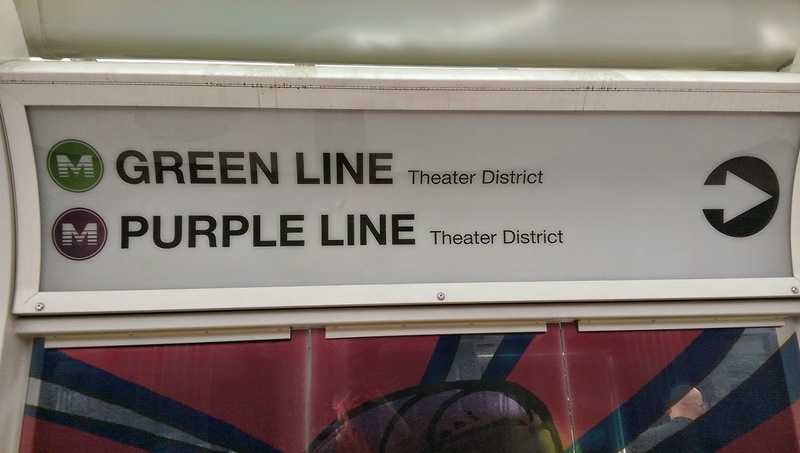 It's expensive to rename a stop when you consider all the maps that have to change. I say they charge the company that bought the naming rights for the switchover. But another option would be to pick generic stop names that are likely to be stable: UH, Astros, Dynamo, and Texans/Rodeo Stadiums. 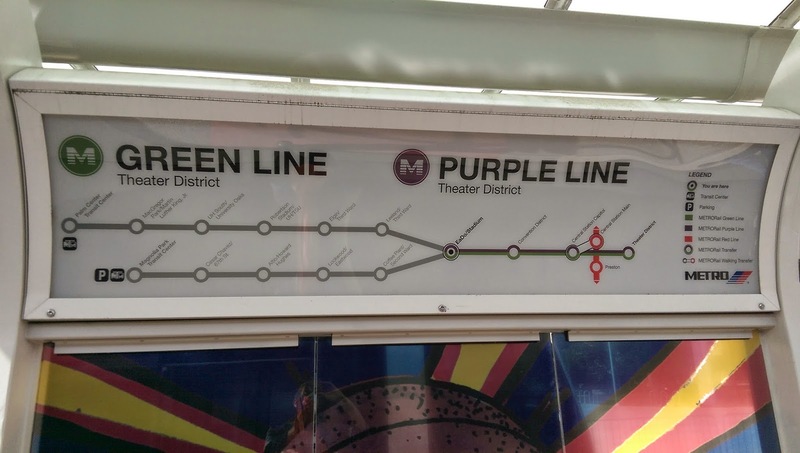 Final cost numbers are $823 million for the 6.6 mile Southeast/Purple line and $587 million for the 3.3 mile East/Green line, for a total of $1.4 billion dollars (!). To work that out on a per-mile basis, it has to be noted that both lines overlap about a mile downtown, so really only 8.9 miles of new track was created (not 9.9). That works out to $158 million per mile, folks. Ouch. As nice as they are, that's a hard number to stomach. Did I mention this was the ugly section? "Rognlie is attacking the idea that rich capitalists have an unfair ability to turn their current wealth into a lazy dynasty of self-reinforcing investments. This theory, made famous by French economist Thomas Piketty, argues that wealth is concentrating in the 1% because more money can be made by investing in machines and land (capital) than paying people to perform work (wages). Because capital is worth more than wages, those with an advantage to invest now in capital become the source of long-term dynasties of wealth and inequality. Rather than taxing businesses and wealthy investors, “policy-makers should deal with the planning regulations and NIMBYism that inhibit housebuilding and which allow homeowners to capture super-normal returns on their investments.” In other words, the government should focus more on housing policy and less on taxing the wealthy, if it wants to properly deal with the inequality problem." "Does Houston need this? For those who dislike messing with success, the answer should be no. As geographer Joel Kotkin has repeatedly noted here and in other publications, Houston’s pro-growth mentality—which is distinct from the “Smart Growth” ethos of government planners—is central to its success. While many highly-regulated cities have declined, Houston has in the last two decades fostered booming oil, health, housing and manufacturing sectors. Since 1990, its population has grown by 29%, five percentage points above the national average, and it has become the de facto Gulf Coast capital. Along with this growth has come increased quality of life. According to data from Praxis Strategy Group, a consultancy affiliated with Kotkin, Houston residents have the nation’s highest standard of living when combining average salary with cost of living, something attributed to its unregulated—and thus cheap—housing market. If the plan’s point is really just to pursue these goals through more data and coordination, so that officials know, for example, where to build parks and fill potholes, then it should prove benign. But that is rarely the way master plans are interpreted. Instead, their lofty goals are used by officials to justify expanded government. What results is the generic list of Smart Growth measures that planners use to try converting automobile-oriented cities into dense, “sustainable,” European-style ones. 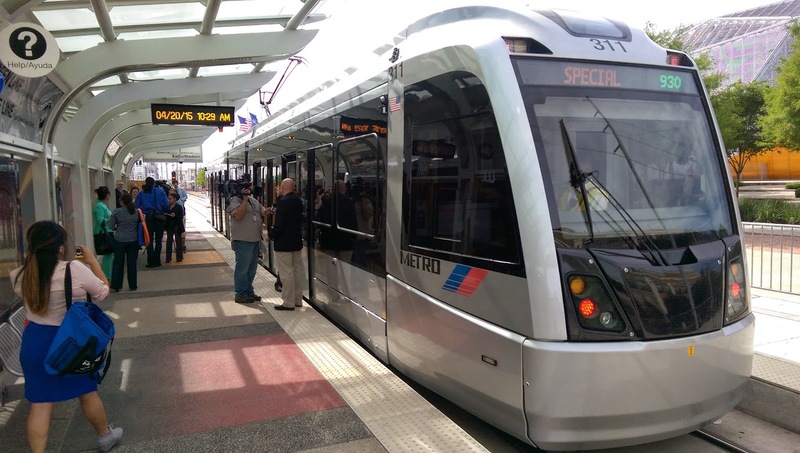 The plan may also encourage expansion of the light rail system, which Tory Gattis, Kotkin’s colleague, believes is inadequate for the spread-out city, especially compared to the growing taxi and ride-sharing industries. If the plan adds an ambitious open-space preservation program, then Houston can kiss goodbye its pro-development climate. All these policies have been used in heavily-planned cities like San Francisco and Portland, contributing to their high taxes and lack of affordability. The ironic thing is that Houston’s outward growth and congestion has already created demand for development inside the I-610 loop, which encompasses downtown and surrounding neighborhoods. Given this organic urbanization, master plans may be unnecessary, or even counterproductive. The city’s lack of zoning, after all, has made it inviting for such infill projects. But if the plan creates a litany of new regulations, they could be used by neighborhood activists to discourage development, as happens in planning-oriented cities. 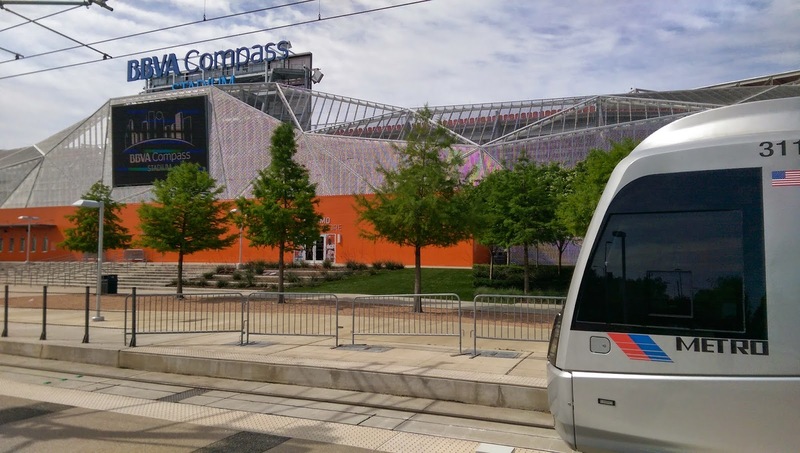 If city officials are really interested in greater density—along with other urbanist goals like increasing wealth, job creation, and diversity—perhaps they should scrap the plan and keep Houston like it is." More on Houston's new general plan here and my own thoughts here. Speaking of the Astrodome, the 50th birthday party is this Thursday (Chronicle story), including the opportunity to walk on the floor of the dome and gaze up at that amazing ceiling. I hope the 50th birthday celebration is an energetic spark to add some momentum to the new ULI plan. "Nearly 48,000 people – including President Lyndon B. Johnson – crammed into the glistening new Astrodome on April 9, 1965, to watch the New York Yankees fall 2-1 to the newly renamed Houston Astros." The Chronicle's story on the 50th anniversary of the Astrodome. A baby was born every 5.5 minutes. A death was recorded every 14.2 minutes. Someone moved to the region from overseas every 16.3 minutes. Someone moved to Houston from elsewhere in the U.S. every 8.0 minutes. All told, Houston's population grew at the rate of one new resident every 3.4 minutes last year." Spieler grew up in the San Francisco suburbs, he told us, before moving to Houston for college. “I thought Houston was an awful place, but I would put up with it to go to Rice. But by the time I graduated I loved this place.” Our attraction? An openness to new ideas. “There are cities which try really hard to block any change. And politically, the questions you get asked are: how long have you lived here? Who were your parents? Who do you know? I never would have ended up on an appointed transit board in a city like San Francisco. This is a city where, if you have good ideas and you’re willing to push for them, people will listen to you. 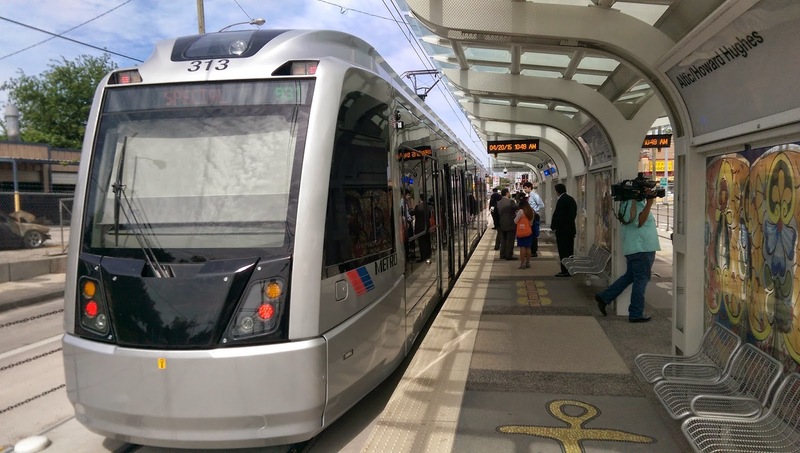 It gives me endless hope for Houston’s ability to keep changing.”"
Speaking of good transit, excellent free market transit solutions are popping up all over San Francisco. 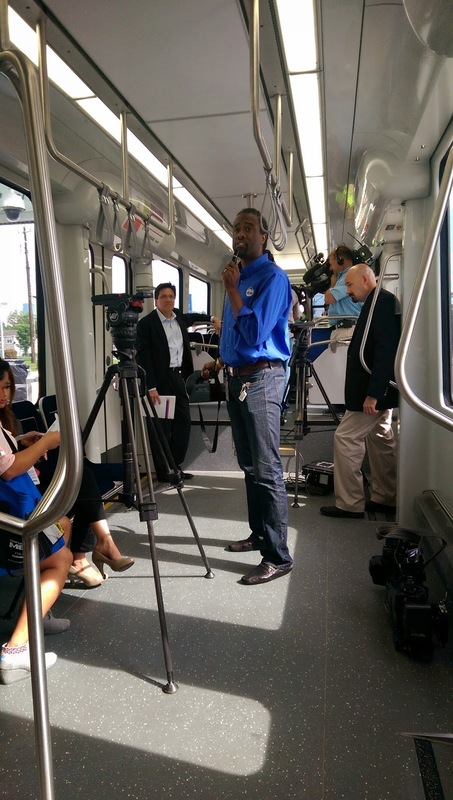 I'd love to see this happen in Houston and for METRO to encourage it... Hat tip to Mihir. "When many of these voters think of economic dynamism, they think of places like Texas, the top job producer in the nation over the past decade, and, especially, places like Houston, a low-regulation, low-cost-of-living place. In places like Wisconsin, voters in the middle class private sector support candidates who cut state pensions and pass right-to-work laws, so that economic governance can be more Texas-style." "If you pretend that the United States is populated exclusively by twentysomething graduates of national research universities, you'll develop the sense that everybody is moving to the city centers of New York, Chicago, San Jose, and Boston. In fact, all three of those metro areas have seen more Americans leaving than coming in the last five years. The cities with the highest levels of net domestic migration since 2010 are Houston, Dallas, Austin, Phoenix, Denver, and San Antonio. Once again, we're talking about Texas. 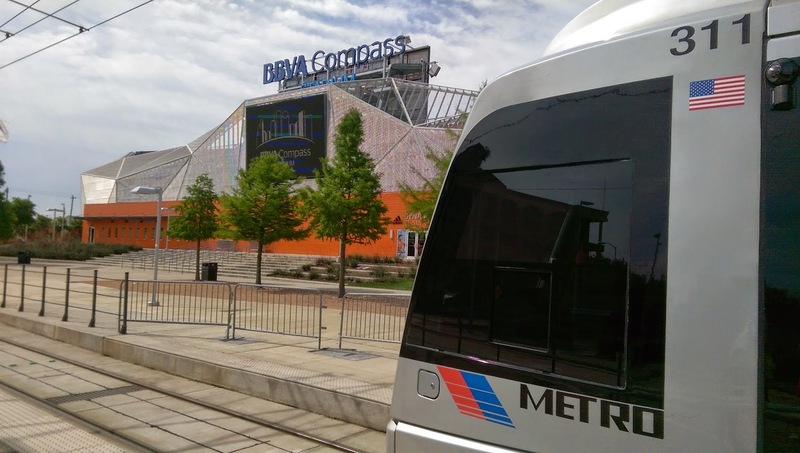 More broadly, we're talking about sprawly metros with fast-growing suburbs in the Sun Belt." Adding his hat (well, helmet) into an already crowded ring, Texans defensive end and 2014 NFL Defensive Player of the Year J.J. Watt announced today that he'll be running for Mayor of Houston, instantly vaulting to front-runner status. Citing Arnold Schwarzenegger as his political role model, he vowed to tackle - literally - Houston's pension, pothole, crime, and traffic problems, saying he expected them to be far easier than many of the offensive linemen and running backs he's had to deal with. He specifically warned the firefighters that he may have to "get physical" and "bring the hurt" in pension reform negotiations, a remark that sent them scrambling to rethink their position. He also unveiled an innovative new plan for combating traffic congestion: during rush hours, he pledged to stay helicopter airborne for rapid response to crash scenes where he would personally clear vehicles from the mainlanes to the shoulder using his bare hands. And further demonstrating his "hands on" management style to tackling Houston's crime problem, he pledged to make himself available in the "bad cop" role for all police interrogations, a move expected to dramatically increase confessions and the case clearance rate. 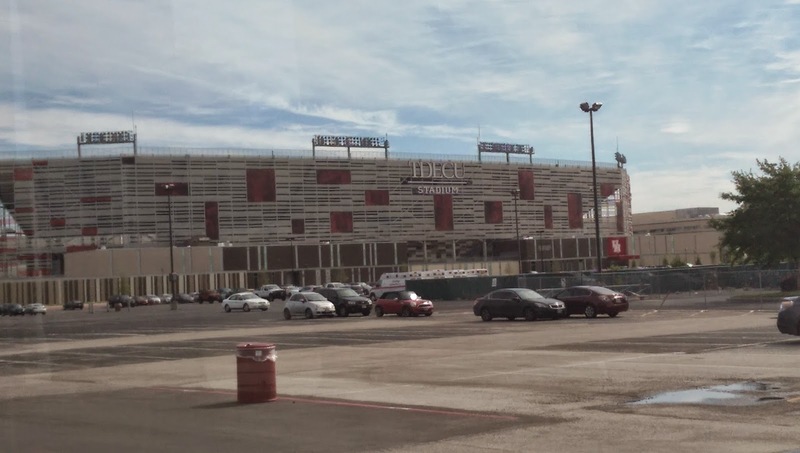 Asked about campaign funding, Watt noted that his recent $100 million contract with the Texans would allow him to easily self-fund and avoid outside money influences - not that he expected to need to spend much on advertising in any case, "I think a reasonably good number of Houstonians already know who I am - name recognition should not be much of an issue." Asked about economic development, Watt smiled cryptically and said he expected simply to "have a word" with the Saudi Oil Minister about cutting oil production and increasing prices, "I'm sure we'll be able to come to a handshake deal - a very, very... very firm handshake." Watt also pledged to personally "sack" incompetent or lazy City managers or employees, a threat that sent waves of fear - and a sudden uptick in productivity - throughout the ranks. In other news, immediately after Watt's announcement, Adrian Garcia's office sent out a press release stating he was perfectly happy as Harris County Sheriff and had no plans to resign and run for another office.